Getting back into the swing of things has been much harder than I had expected. After I wrote the personal update last Monday, I really did intend to jump right into some projects and blogging. I quickly found out that DIYing is like a muscle. If you don’t use it regularly, it begins to atrophy. 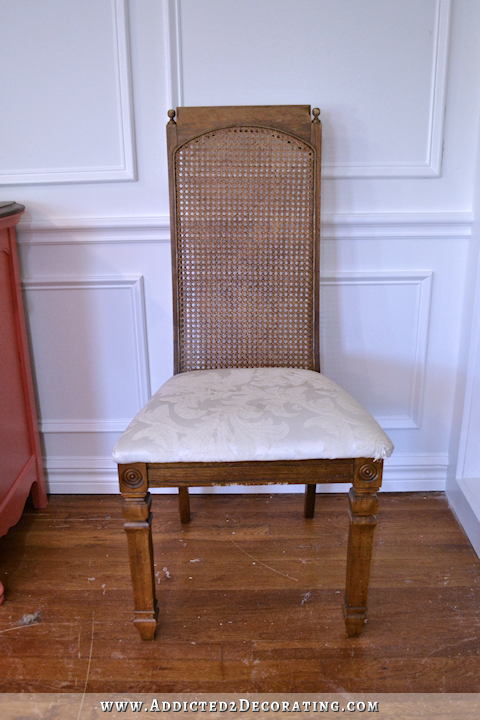 I began working on two of my dining chairs — the ones that will flank the buffet on the entryway wall — and while I did have some do-overs early on in the day, I made myself push through. By about mid-afternoon, I finally felt like I was starting to get back into the groove. 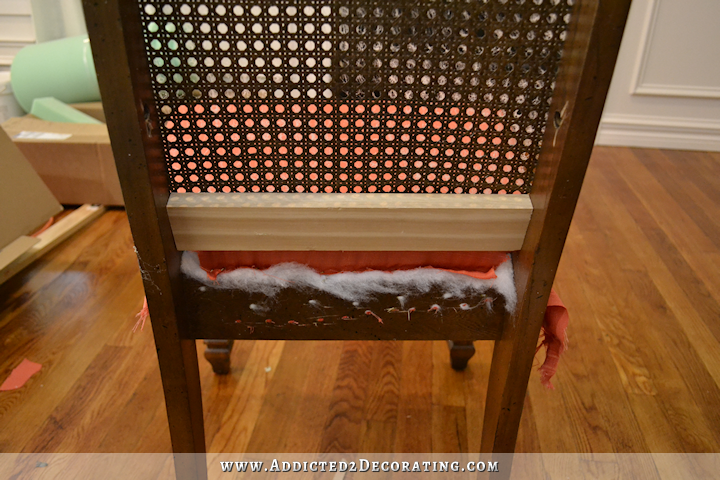 So before I could start upholstering, I had to make some minor adjustments to the frame of the chair. The little finials that were on the top corners had to be removed, and the corners squared off with some wood pieces. I also cut new plywood for the seats because the originals were particle board, and some of them weren’t in good shape anymore. 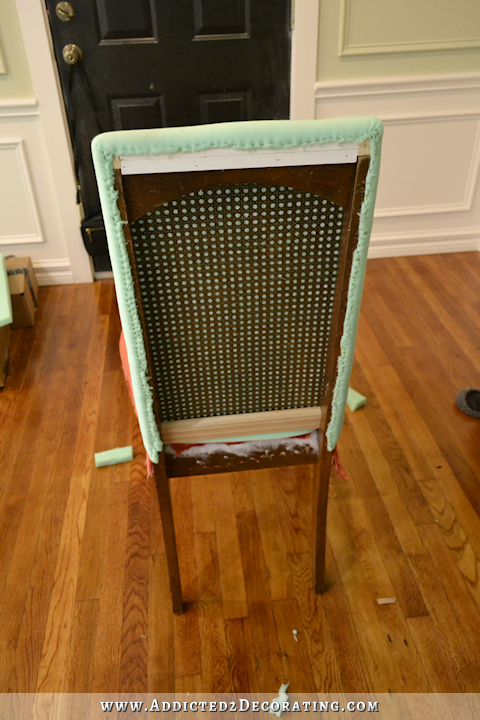 And because this was going to be more than a wrap-and-staple upholstery job on the seats, I went ahead and glued and nailed the plywood to the chair frames. One other adjustment I had to make is to cut away a portion of the cane rom the lower part of the back so that foam and fabric could fit through later. I used 2-inch high density foam on top of the plywood, and used spray adhesive to keep it in place. Then I cut it to size with an electric knife, like the kind you use for cutting a turkey or brisket. 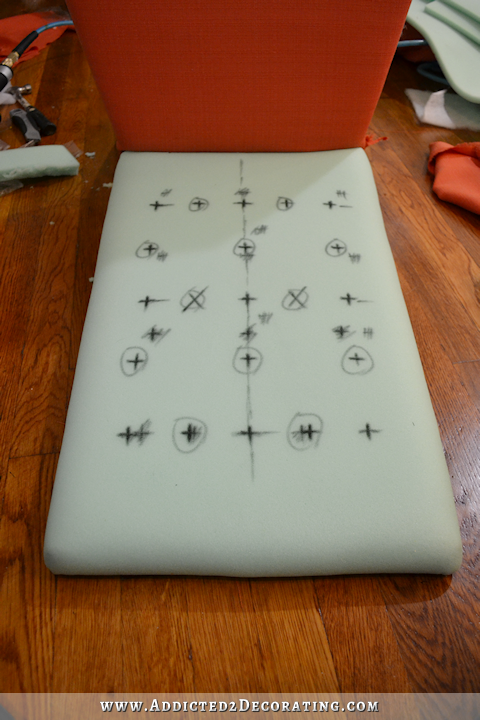 Next I cut a piece of fabric large enough for the seat, placed it on the foam upside down (i.e., the right side of the fabric facing the foam), and pinned the front corners so that they fit around the corners of the foam. 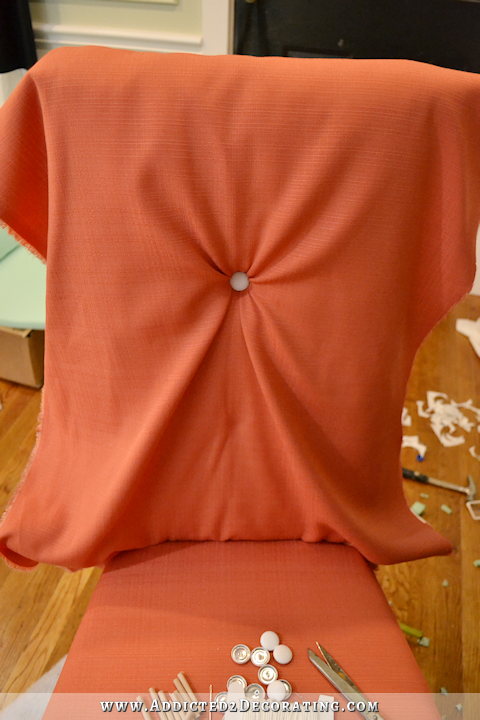 Then I sewed those angles into place. With the corners stitched, I cut away the excess fabric, flipped the fabric over with the right side facing up, and then fit the fabric back over the seat. 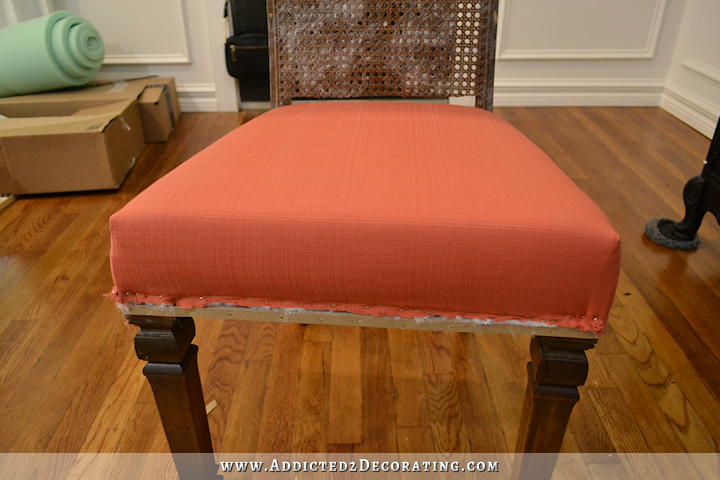 This time I used two layers of high-density polyester batting wrapped around the seat before adding the fabric. And I stapled it all around using 1/2″ narrow crown staples. By the way, I bought a new stapler for upholstery projects. 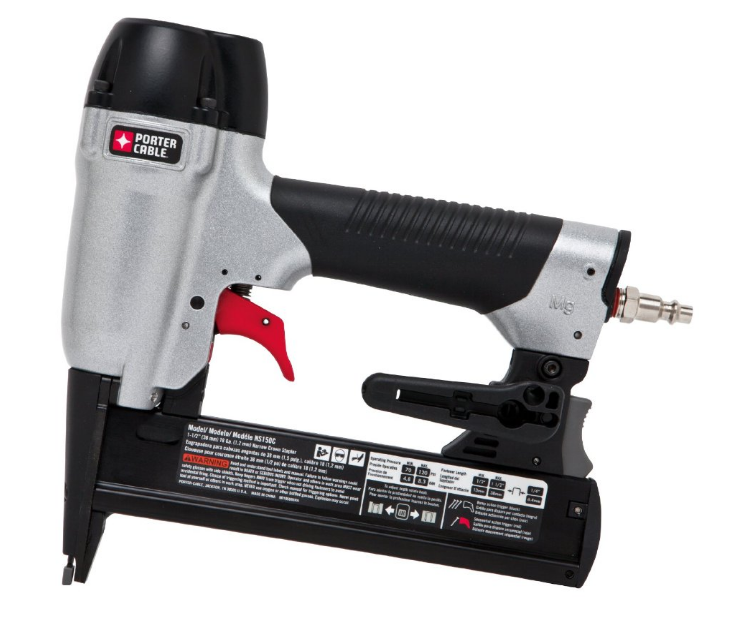 I purchased this Porter-Cable narrow crown stapler*, and it is AWESOME! Before I could start upholstering the back, I had to add some support to the bottom edge of the cane where I had cut into it. I just used a scrap piece of lumber cut to the right width and nailed it to the chair frame. Then I stapled the bottom edge of the cane to the new support piece. 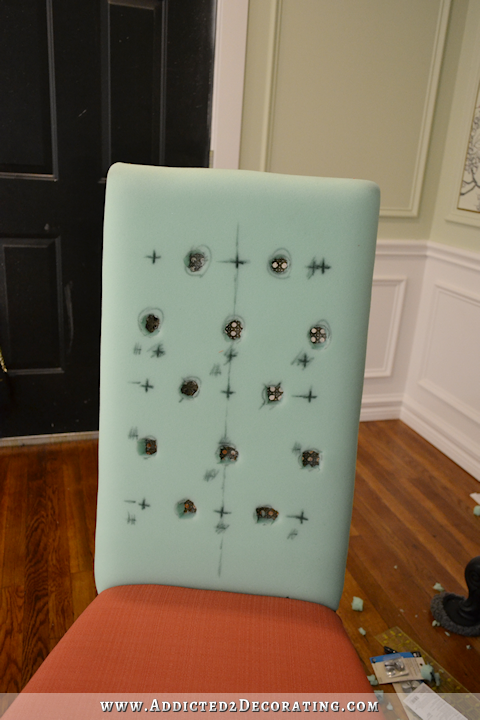 Then I could add the foam to the back. I used 1-inch high density foam, and used spray adhesive to hold it in place. 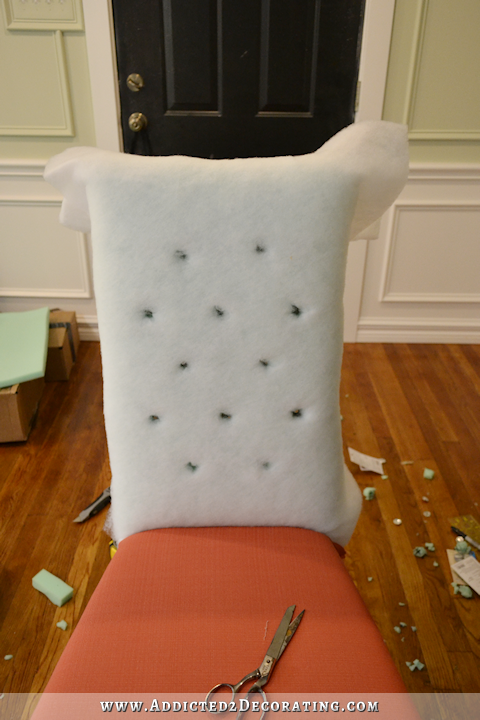 Then I wrapped the foam around the edges and stapled it right along the top and side edges on the back of the chair. But I finally got it, and then used my scissors to cut away the foam where I wanted the buttons to go. I added two layers of batting on top of that, and kind of dug holes where the buttons would go. And then I started tufting. I always like to start my tufting close to the middle, and work my way out. I used 7/8-inch cover buttons, and used leftover Roman shade fabric for the buttons. There’s one main difference in all three of these, and that’s how I secured the tufts. 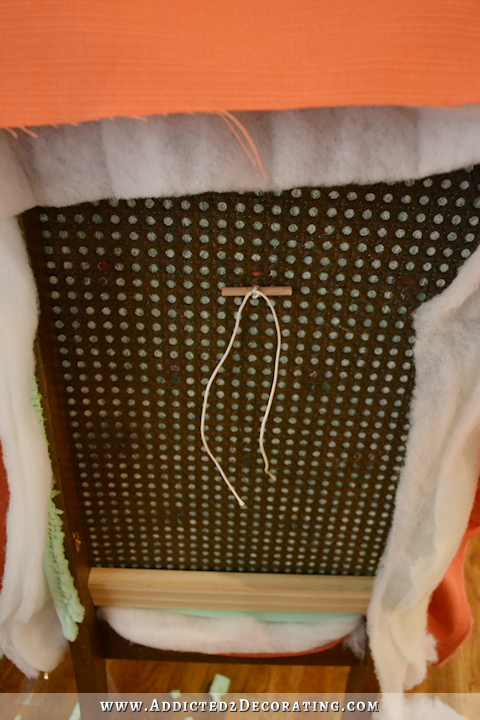 On the headboard, I was working on a large piece of MDF, so I pulled the string that was attached to the button to the back, and just stapled the string to the MDF. 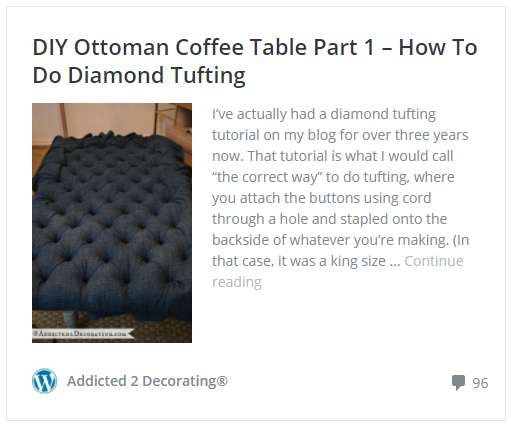 On the ottoman, I wanted to demonstrate an alternative way to create diamond tufts on something that uses MDF or plywood as a base, so on that one I used screws and washers to hold the tufts into place. 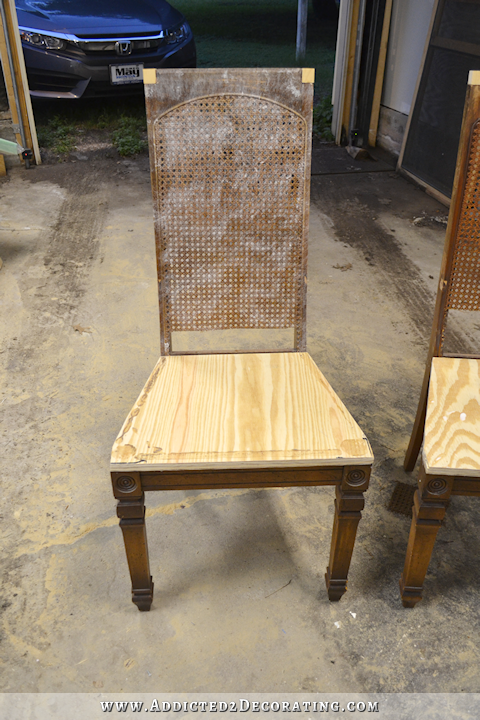 On these chairs, neither of those methods would work since I was using caning as the backing. I obviously can’t staple or screw into caning, so in order to hold the tufts into place, I used small cut pieces of 1/4-inch dowel rod. So using a long upholstery needle, I fed the cord from the back to the front, fed the cord through the eye on the back of the button, and then fed it back through to the back of the chair. Then I removed the needle, and tied the cord around the dowel rod piece. I repeated that process for each button, so when I was finished, I had 12 pieces of dowel rod on the back, each with a cord wrapped and tied around it. I didn’t quite get the back finished. I started cleaning up the edges a bit, and getting those stapled into place, but I didn’t quite get all of it done. But at least I got the hardest part done! So hopefully today I can get the skirt and back finished up on this one, and make some good headway on the second one. That’ll get me very close to having a finished entryway wall! Then I just have to repeat that process six times for the chairs that will go around the dining table. 😀 Those won’t have skirts, though, so that’ll save me some time. UPDATE: This chair is finished! Click here to see the rest of this project. Oh my goodness! Six more times… Looking good… And just a reminder (not from me, but from CS Lewis) – we do not “go through grief”, “grief goes through us”. Lewis wisely understood that it is a process with no timeline and really no rhyme or reason… All can be going quite well and then… BOOM… grief overwhelms and goes through us just out of nowhere… Prayers continue for you and all of your family. Kate, you obviously have some experience with loss, because that is exactly the way it happens. I describe it as an ocean wave suddenly washing over you pulling you in its tow. Yesterday was 12 years to the day that we lost our daughter, age 30, to an auto accident. You can be dealing great one minute and without warning the grief just washes over you. But God is good, and has helped us become more able to cope. Feeling blessed. And it’s the littlest of things that can blindside a person. 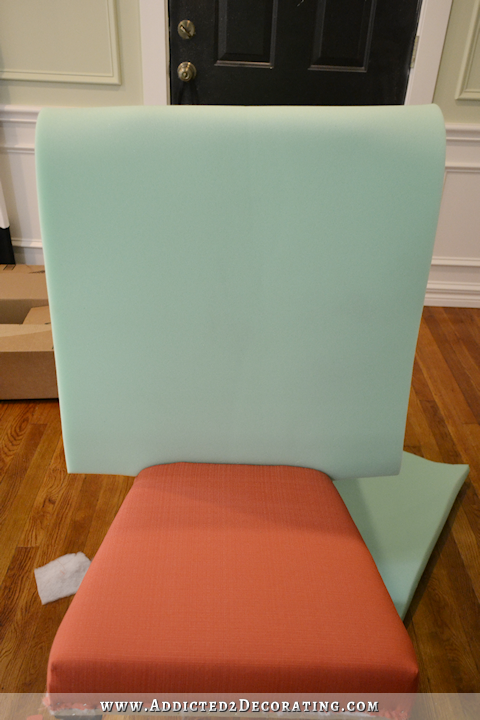 As for the chairs: As I read the post, I thought of all the “stuff” going on underneath the coverings, out of sight. Then had a mental picture of someone, some day, getting those chairs and deciding to re-do them. The upholstery comes off and the person says, “what in the world!” We have learned well from Kristi that there can be interesting things underneath the beauty she creates. Anyway, I chuckled at the thought. And the chairs are gonna be wonderful, of course. Looking great. So happy you’re back. One of the things that brings me back to your blog over and over again is observing your skillful problem solving. Your approach is so well reasoned, so easy to follow, that I always learn something. Thank you so much for the clarity of your directions and wonderful pictures. I can’t wait to see what you tackle next. I agree! You make things very clear, and I love that you explain how/why you arrived at the final product. So glad you have returned to us! But feel free if you need to back off, I, for one, will understand. So agree with you Marianne in MO!!! I don’t think I have the courage/talent to try many of the things you do, but I so enjoy watching your progress. I love the coral! 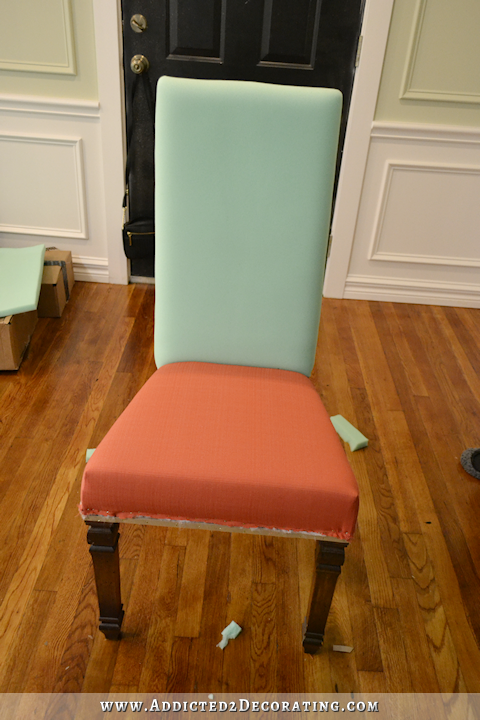 I love, Love, LOVE the color you chose for your chairs!!! Kristi, Welcome back. I lost my mom a year and a half ago, and for me, the early part of grieving was like swimming from floe to floe in an unpredictable sea. You swim through the grief, and then there’s a brief respite on a small ice floe, but unexpected circumstances can force you back into the sea. At first, the floes are far apart, but as time passes, they are larger and closer together, and the times you’re in deep water are fewer and fewer. I can still find myself unexpectedly swimming. Like when I leave work, and I have a few minutes to call and visit with her, because I know she’s in the kitchen, near the phone, getting supper together. And then I know she’s not. And I’m back in the sea, trying not to let it overwhelm me. And not always successful. God is good, though, and He always sends another patch of ice for me to crawl onto. I love your chairs. Are you still planning for a monogram on the back. REALLY excited to see that! Your work ethic amazes me. Keep your chin up! Kristi, this is really a great read! 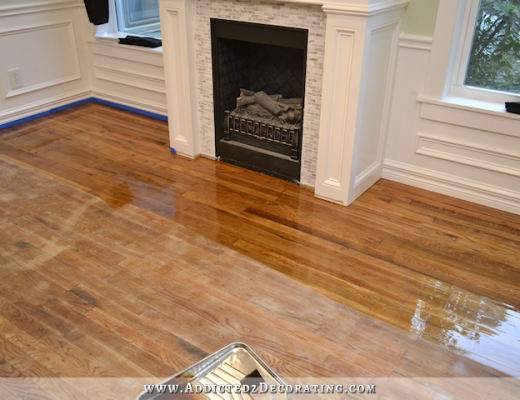 We always love to see awesome DIY projects, and you lay everything out with a lot of helpful information and personality! Great job! Good grief, this is impressive! I’m astonished at the amount of creativity and work this is, but I’m also new to you so I understand this is the norm? I think I’m doing well to paint a wall and make the bed . . . Beautiful work! Jimmie, hang onto your hat! Kristi’s work is simply mind-blowing! Look back through her old posts, and you’ll be simply gobsmacked! The other thing about Kristi’s work, and then her sharing it on her blog in such a clear and concise way, is that it makes you able to see that this is also possible for others to do, so it becomes incredibly empowering. 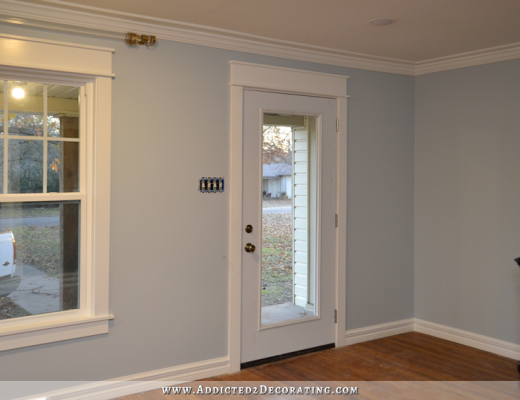 I am now tackling so many projects, which two years ago I never would have contemplated doing myself, simply because I have seen Kristi do similar things. I figure if Kristi can do it, she must’ve started somewhere, so I’ll give it a go, too. Jimmie, like the rest of us, I’m sure you’ll be waiting for her blog posts to appear in your inbox, so you can follow her journey. 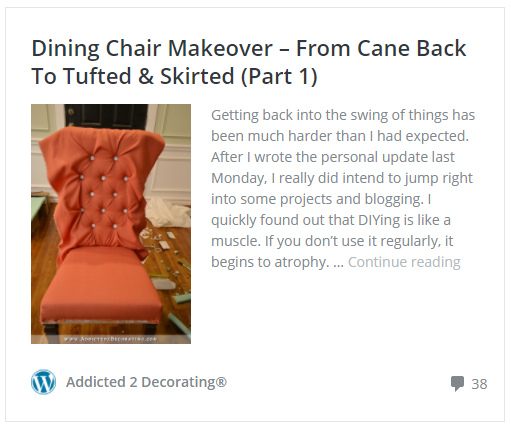 One of the best things I have ever done has been to find and follow Addicted 2 Decorating. Thanks so much, Kristi! Interesting and pretty. I probably would have used a nut or washer for fear that the dowel would end up working it’s way out. I have a tufting project that I may tackle one of these days and you do always end up with a piece that looks as if It could have been purchased. Thank you so much for this step by step on the chairs. I hope to try this someday. Such a pretty color and the tufting is gorgeous. Love your blog! Although obviously you don’t know me, through following your blog, I feel as if I know you and my heart goes out to you on your loss. I’ve wanted to post comments for months after reading one incredible project of yours after another. I love your taste and am amazed at your abilities. I’m also very appreciative of your tutorials. Is there anything you CAN’T do?! You’re very inspirational. Just wanted you to know you have a new fan who is sending you warm thoughts as you make your journey through your grief process. 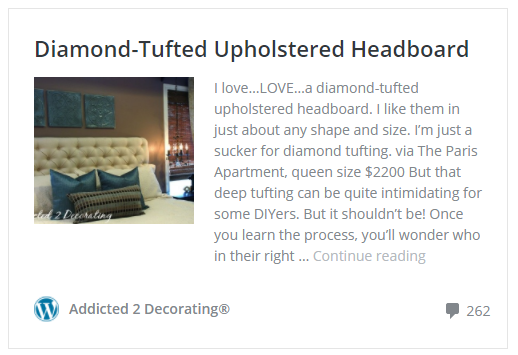 Oh my gosh, I have a headache just thinking about doing that tufting. I am glad you are so talented and can’t wait to see them finished. 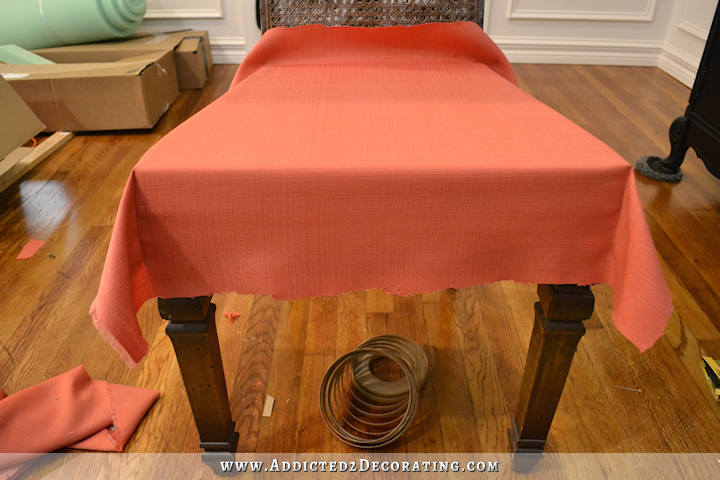 Love the coral fabric and btw your floors look beautiful. The chair looks great! You certainly have patience! As always, I so admire that when you have a vision for something, you’re able to execute it beautifully (no matter how many attempts, lol, which I equally appreciate!). Seriously no one would know those were cain backed chairs. And that fabric will be such a lovely pop of color in your dining room. I can’t wait to see the finished results! I am so glad your back….though my heart goes out to you and your family. Did I miss something are you not doing the monogram???? 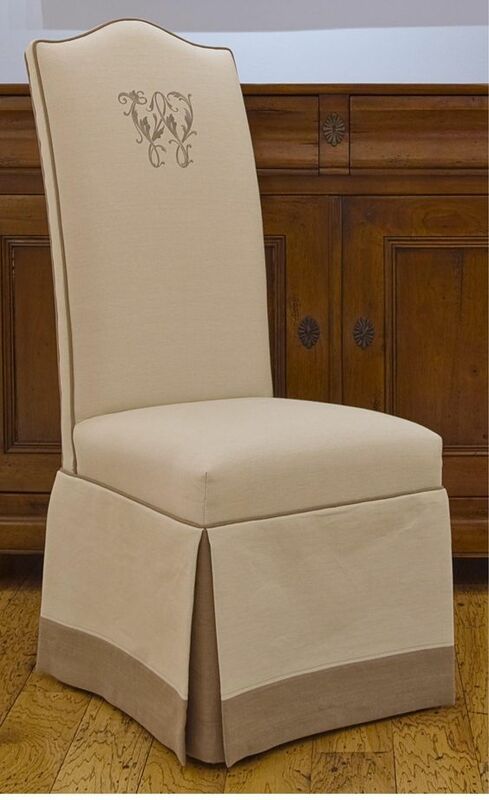 I’m planning on doing the monogram on the chairs that go around the dining table. I wanted these entryway chairs to be a bit different. where do you purchase your foam supplies? I actually purchase most of them from JoAnn Fabric using 50% off coupons (or at least 40% off, or when they’re on sale). We do have an upholstery supply place here locally. I think it’s called Heart of Texas Foam & Fabric. But it always seems like when I’m ready to go buy supplies, they’re closed. Excuse my French …..but holy sheeeeet darlin!!!!! Is there nothing you can not do? 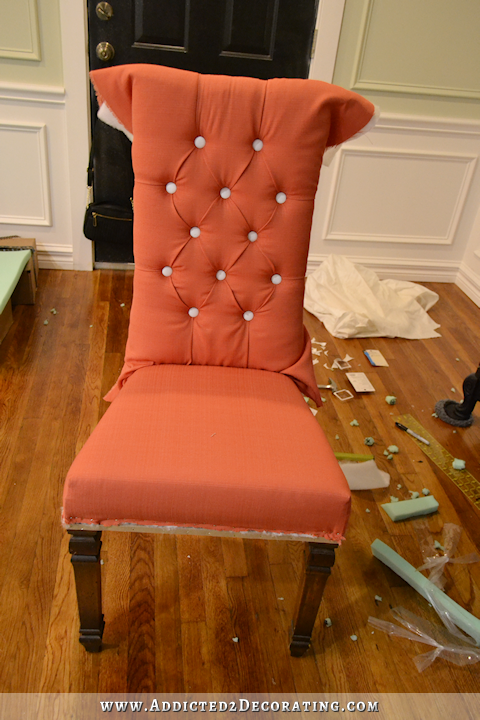 Wow Kristi, the transformation of the chair is looking absolutely incredible. Your vision and talent is so inspiring. I would never think to take on such a project like this, but with all your photos and explanations, I really feel like I could do it too. You are an inspiration! I also want to give you and your Mom my deepest sympathy for the passing of your Bonus Dad. It has been a year since I loss my Dad to Parkinson’s related symptoms too. It’s a difficult time and I understand what you’ve been through. I like how the fabric really does fold itself into a diamond shape! You’re putting so much work into these chairs. I bet you’re going to scotchguard those, right? Because the first food spill to hit the chair is going to be a real bummer…. The chair looks really pretty and I am looking forward to part 2. 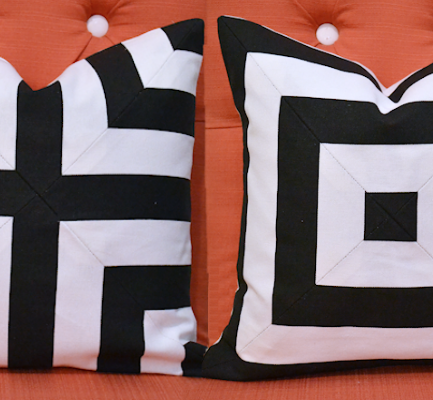 I always hesitate to Scotchgard upholstery because that stuff is so darn toxic. But on the other hand, I sure don’t want these getting messed up with food being dropped on them! *Sigh* I just don’t know. 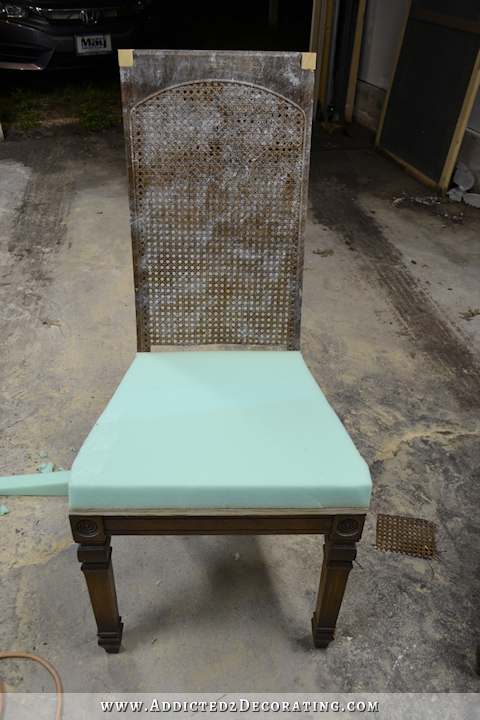 The chair is looking just beautiful and it’s going to be a fabulous room. Keeping busy helped me. Be kind to yourself and do whatever feels right for you. First of all, I’m sorry for your loss. I’m sure that it will take a while to get back into your decorating groove so take your time. Secondly, I love those chairs! 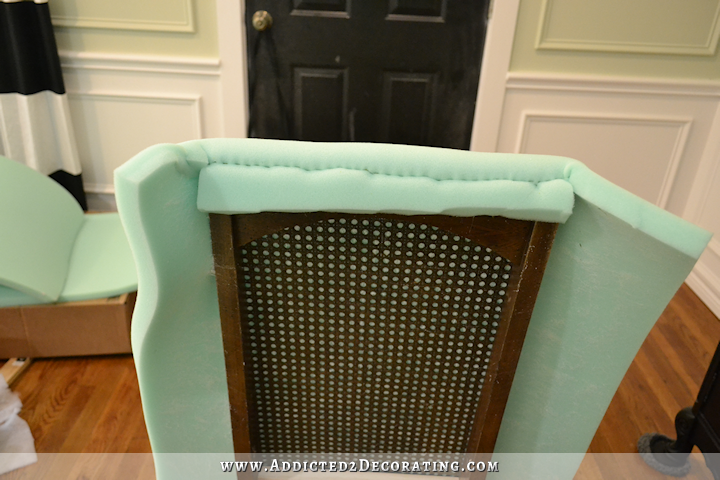 The tufting is so cool and the color will look great in your dining room/entry area. I admire not only your creativity, but your tenacity! 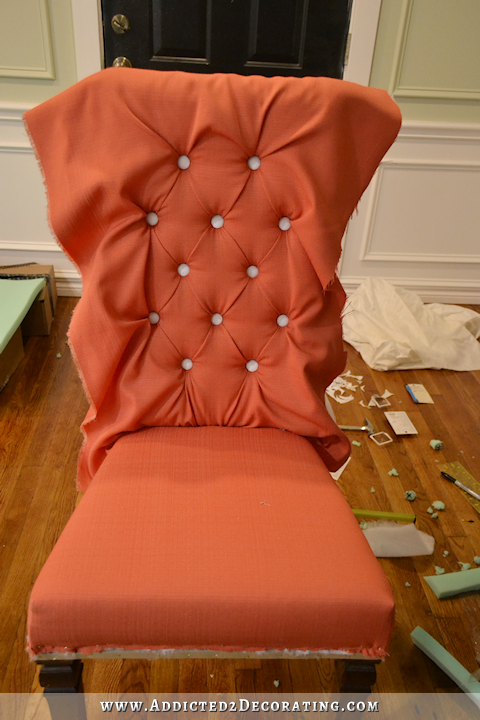 the chairs are going to be amazing. I love this idea. 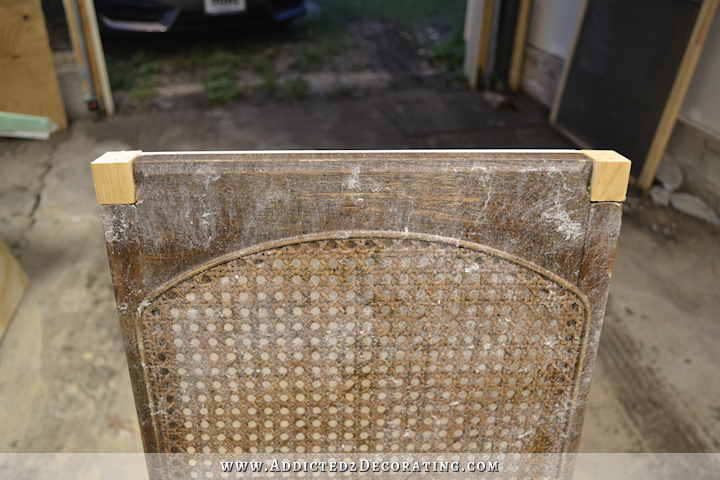 Recycling the mid century chairs into a completely different look…..amazing!!!! Wow, that chair looks spectacular already!! I was wondering if you were okay as I didn’t see posts coming to my in-box so I’m glad you got started again. I agree that the hardest part is starting again after a pause. Again, I am so sorry for the loss of your Stepdad! Upholsterer’s trick for buttoning: Cut your string to length (about 12″ or so), slide your button onto the string, then thread both ends through the needle. Now you can just go through fabric one time from the front!! Welcome back – you were missed. 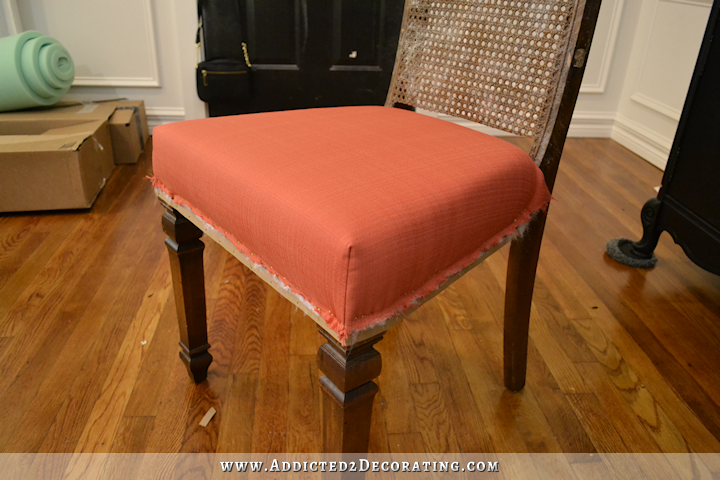 I’ve never seen upholstery done before – I had no idea how it worked! Fascinating. Kristi, I love these! Do you have a tutorial for how you made the skirt? Thank you!